As the New Year begins, Anderson helps viewers get a fresh start for 2012. Anderson takes TheDirty.com Founder Nik Richie to task, confronting him about his website, which profits from people posting dirt on others and ruining reputations. Reputation.com’s Howard Bragman joins the show to share how viewers can counter digital defamation and safeguard their reputations online. Documentary filmmaker Morgan Spurlock also joins Anderson to talk about his new online show, “Failure Club,” in which he helps people get beyond their fear of failure, enabling them to pursue their dreams. In a daytime exclusive, superstar Angelina Jolie spends the hour with Anderson in an intimate conversation about her family, Brad Pitt, her new movie, the paparazzi and much more. This episode of 'Anderson' originally aired on Tuesday, September 27th. If you missed our original post, please click here. Anderson met two young girls who preformed CPR on one of their moms and saved her life. The girls had learned CPR from watching Grey's Anatomy and Patrick Dempsey joined in via satellite. Anderson spoke with Jonathan Safran Foer, the author of one of Anderson's favorite books, "Extremely Loud & Incredibly Close," which is now a feature film starring Tom Hanks and Sandra Bullock. And there were a couple of holiday viral videos, where the "stars" of the videos were on stage to recreate "YouTube" moments. This episode of 'Anderson' originally aired on Friday, October 28th. If you missed our original post, please click here. For additional information on today's program, please visit andersoncooper.com by clicking on the hotlink below. In addition to Matt Damon and Scarlett Johansson all the remaining stars of "We Bought A Zoo"; Thomas Hayden Church, Elle Fanning, Colin Ford, and Maggie Elizabeth Jones joined Anderson on stage, along with director Cameron Crowe and Benjamin Mee, the man who really bought a zoo and moved in with his family. 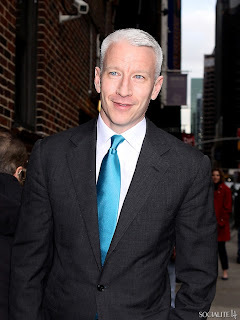 For additional clips and information on 'Anderson' please visit andersoncooper.com by clicking on the hotlink below. Warner Bros.' Anderson led the first-run freshman at a 1.3, off 7% from the prior week. A behind-the-scenes look at Radio City Music Hall, with a New Year's Eve message for Anderson Cooper and Kathy Griffin from the Rockettes. Don't miss Anderson and Kathy's live show from Times Square on Saturday at 11 p.m. ET! Tomorrow's look back with include Anderson's appearance on The Late Show with David Letterman, to promote the New Year's Eve show. This episode of 'Anderson' originally aired on Thursday, December 1st. If you missed our original post, please click here. Today we are looking back at the episode of 'Anderson' that aired Tuesday, December 20th - Jane Fonda. Plus, Should Parents Be Charged for Their Kids' Underage Drinking? Anderson spoke via satellite with a professor who was arrested for contributing to the delinquency of minors after (to his surprise) teenagers were found drinking in his home. There was a discussion on parental responsibility and Sunny Hostin, along with journalist and blogger Rene Syler, joined in with tips on how parents can protect themselves. This episode of 'Anderson' originally aired on Friday, November 18th. If you missed our original post, please click here. Today we are looking back at the episode of 'Anderson' that aired Monday, December 19th - Angelina Jolie & the Cast of 'In the Land of Blood and Honey' Angelina discussed her work in films as well as her humanitarian efforts and her home life. The cast of the movie was also on stage and shared emotional stories about living through war in Bosnia, as well as what it was like to be directed by Angelina. All Things Anderson is on a blogging light schedule during the holidays. We’ll be keeping track of who is in the 360 anchor chair and the guests on Anderson but won’t be going into detail on either program. We hope everyone is enjoying the holiday season. We hope everyone is enjoying the holidays. Shopping, wrapping, baking and cooking; not to mention the time we spent caroling, left little time for blogging last week. This week, we'll take a look back at what we missed on 'Anderson' and the "extras" we found. If there is a specific clip you would like to see from this show or any that aired last week, please leave your request in the comments section. 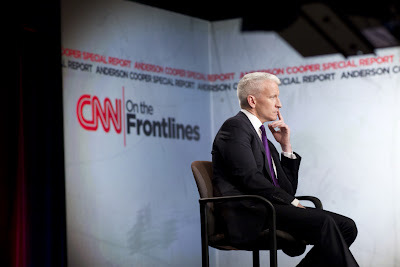 For additional clips and information on 'Anderson' please visit andersoncooper.com by clicking on the hotlink below. The website contains an entry form for a chance to win one of the gift bags given to audience members at the taping of the holiday show. As is our tradition here are our annual Classic Cooper Christmas Clips. It's a collection of favorite Anderson Cooper Christmas moments. It’s Anderson’s first New Years show with special guests Gloria Vanderbilt and Kathy Griffin. Gloria and Kathy take viewers along on their shopping trip for New Years Eve and share their outfit picks for this year. Plus, Patrick Dempsey surprises the real life GREY’S ANATOMY heroes. Mark Wahlberg Returns to His Hometown. Anderson speaks with Academy Award nominee Mark Wahlberg about an epidemic affecting high school students. Current statistics reveal one-third of all high school students drop out before graduation. Anderson spends the hour exploring why we eat what we eat, including the odd patterns many people have with food consumption. For the first time in his life, Anderson tries spinach, Brussels sprouts and coffee. 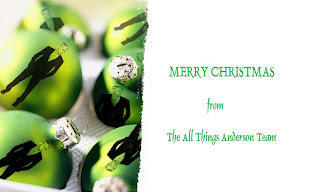 All Things Anderson is on a blogging light schedule during the holidays. We’ll be keeping track of who is in the 360 anchor chair and the guests on Anderson but won’t be going into detail on either program. If you have a clip request for any segments on either show please mention it in comments. We’ll try our best to post it after Christmas. We hope everyone has a happy holiday season. We're a smart bunch here at ATA and know we can't hold a candle to the professionals when it comes to singing. So we'll close out the week with Nsync's acapella version of 'Oh Holy Night'. Merry Christmas everyone! Did you know?An obscure French poet wrote the words for the song, which was composed by the writer of the famous ballet, "Giselle." We hope everyone is has a happy holiday season. The ladies had a few too many hot toddies before heading out last night. But our 'Joy to the World' brought the house down. Did you know?For many years, the tune was credited to the composer of "The Messiah," George Handel. AC360: Dr. Sanjay Gupta was back in the anchor chair for the third night. Last night we took our show on the road caroling during our sleigh ride. 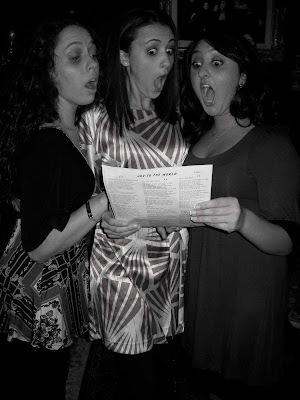 We didn't sound quite as melodic as The Ronettes but after a some spiked cider we rocked it! Did you know? Initially it was solely an instrumental work, and it still is frequently performed that way.